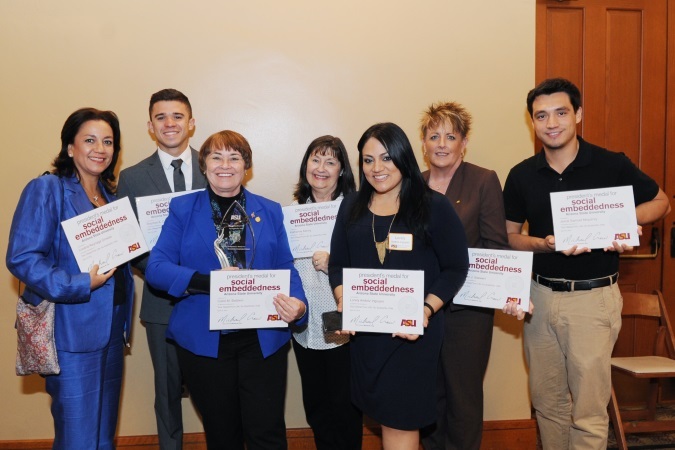 If you are part of a university team working on a project that advances ASU’s goals and aspirations to create dramatic, positive change, you should consider applying for one of the 2016 President’s Awards. The deadline to submit an application is Jan. 7, 2016. Writers Workshops will be held Nov. 5 and Dec. 9 on the Tempe campus. Shelly Potts and Alison Cook-Davis of the University Office of Evaluation and Educational Effectiveness will explain how to write a compelling application that effectively reports a project’s results. Attendees also will get helpful tips and learn about the awards criteria. ASU President Michael Crow will recognize award recipients in April 2016 at the President’s Recognition Reception and award ceremony. Each team will receive a team award and all team members will receive award certificates. Winning team projects also will be featured on the ASU Now website. To register for a workshop, contact Linda Uhley at linda.uhley@asu.edu. Get specific award applications or learn about previous award recipients.